The former president, who is no stranger to sharing gushing public messages about his beloved wife, took to social media on Thursday to pay tribute to his spouse of 26 years by sharing a photo of her busting a move on the dance floor. 'Happy Valentine’s Day to the extraordinarily smart, beautiful, funny, one and only @MichelleObama. 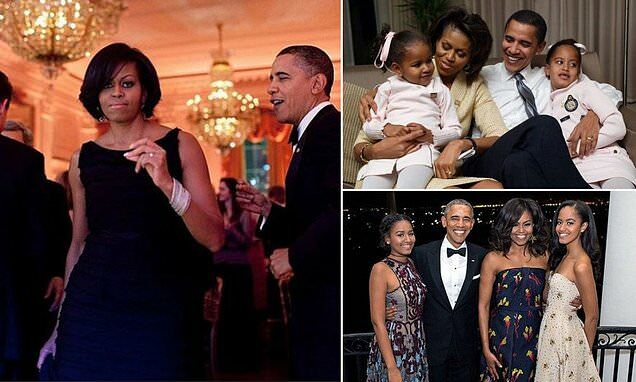 It’s true; she does get down to Motown,' Barack, 57, captioned the playful image of himself dancing with Michelle, 55. In the photo, Michelle is wearing a sleek black gown and snapping her fingers to the music while Barack is gazing at her with love in his eyes. Less than a half hour after he shared the romantic post, the former first lady posted a Valentine's Day shout out of her own. Not only did she honor her husband, but she also included their daughters Malia, 20, and Sasha, 17, in her loving message. As part of the Valentine's Day post, Michelle shared a sweet snapshot of herself and her husband cuddling their daughters when they were young girls. The image was taken when they were waiting for election returns in Illinois the night Barack was elected senator in 2004. 'So lucky to call these three my valentines for all these years,' she wrote. While it's still early in the day, Michelle and Barack are so far the only president and first lady — present or former — to share public messages of love in honor of the holiday.